← Rainbow Cookies and $100 PayPal Cash Giveaway! I know lots of people are starting to plan their holiday menus right now, so I bring you one of the dishes I made for Thanksgiving. It’s perfect when you’re pressed for time since it takes only minutes to make, and can even be made ahead. I’ve been making this for years and it always gets wiped out. The ham was a quick addition since I’d baked one a few days before and had lots leftover. But, it’s great without ham, too! It’s delicious, it’s SUPER easy, and it’s cheap! Heat a few tablespoons of oil in a large deep skillet. Add crushed red pepper to oil (however much you can handle) and cook for around 30 seconds, then add onions and stir. Cook until slightly browned then add peas. Add salt and pepper to taste. Cook peas for just a few minutes…you don’t want them to get too mushy! Add ham and stir through. 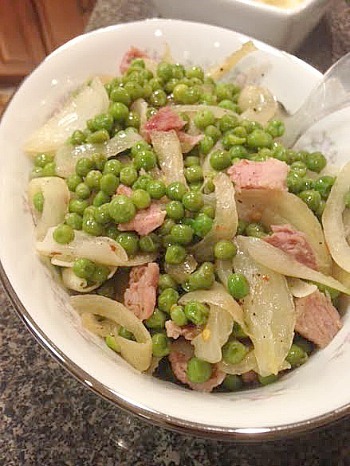 This entry was posted in make ahead, peas, QuickAndEasy, side dishes. Bookmark the permalink.